Whether it's an Android or an iPhone, mobile "smart" phones are truly amazing, providing a revolution in communication over the past few years. Lately we have found that these devices aren't quite ready to act as mobile print production workstations. At least not yet. Here's why. 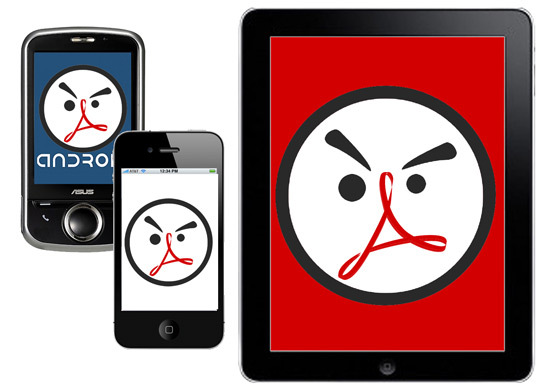 Our CSRs have reported numerous issues with taking the PDF workflow to the iPhone, Android or iPad. User forums across the web are validating these observations. For one, images within PDF documents often display with much more contrast and much darker on the iPad than they will from the same PDF viewed on your desktop. Certain image file types, if used in the original layout, won't display at all, leaving a gaping hole in your PDF proof that you won't understand and won't be able to resist commenting on. Even worse, there are numerous reports of stripped currency symbols and foreign accents, an inability to display Windows-only fonts embedded in PDFs viewed on Apple's devices and inconsistent text rendering (line-breaks, paragraphs, etc.) from one platform to another. We're not saying never, just not yet. For now, you are better off creating, sending and reviewing files from your computer.